A basic plan-o-gram that is visually unappealing with category locations not defined. Install high impact wayfinding category ArcArms™ to help shoppers find products faster and easier. Give your department the “WOW!” factor and keep customers shopping longer. Help customers navigate the sales floor by emphasizing categories within departments. Highlight brands to increase brand sales. Combine with overhead sign systems to visually enhance any department. 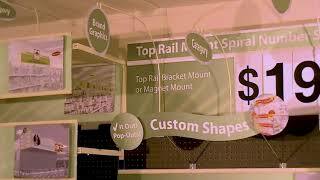 We offer several mounting options to suspend a variety of sign designs.